Childs Farm Hand and Body Lotion is a natural body lotion for children that is suitable from birth and is also suitable for eczema prone skin. It contains grapefruit and organic tea tree oils to provide moisture and hydration as well as a beautiful scent to the skin. 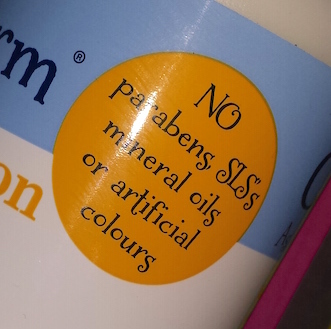 As with all other Childs Farm products, they are free of SLS, parabens, mineral oils and artificial colours. They are also pediatrician approved. Being a huge fan of the Childs Farm Hair and Body Wash for my little man I really wanted to give this product a try. In fact, I recently chose the Hair and Body Wash as my top tested baby product of 2014, so how does this stand up? The Childs Farm Hand and Body Lotion comes packaged in a white bottle that holds 250ml of product and it has a pump lid. To open the lid you need to twist the pump anti-clockwise and pump down. After a bath or shower is usually the best time to apply moisturiser. Whilst drying off your babba or child post bath/shower, you need to apply a small amount of the Hand and Body Lotion to your hands, rub together slightly and gently apply to your child's skin. Make sure it's all rubbed in and focus primarily on areas of dryness. It is a non-sting formula, but still do avoid the eye area and if irritation occurs then wash off with lots of water. Firstly, this moisturiser smells beautiful! It’s so cheerful and fresh (which is great for kids) thanks to the grapefruit oil. It applies easily and absorbs into the skin at a reasonable speed too, which is great if your little one can be a fidget bum! The skin is left silky smooth when this is applied and it helps to relieve any dry areas, such as eczema. Like the product claims, it doesn’t aggravate eczema either, which is brilliant news. The effects of the moisturiser are quite long lasting, but the scent does fade over time. In regards to being used as a hand lotion, I don't usually use lotion on my little man's hands as he will just put them in his mouth! However, the effect that it has on my own hands after applying it onto his skin is rather nice. It leaves the hands feeling soft and comfortable. All together, I really like this product. It does indeed stand up to the greatness of the Childs Farm Hair and Body Wash, and the scent cocktail of the different products when used together is a bit like a fruit basket! For more information about Childs Farm and the main reasons that I love the brand, check out my review of the Caked in Mud! Hair and Body Wash.
You can purchase a 250ml bottle of Childs Farm Hand and Body Lotion for £3.99 from Boots, but at the time of writing they currently have it on offer at 1/3rd off to £2.66! 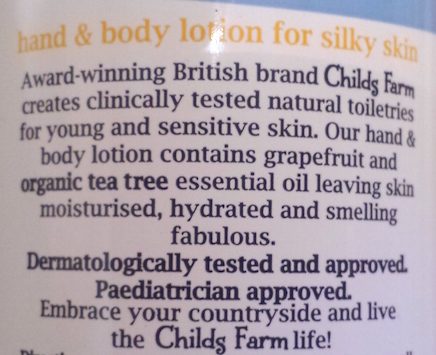 What are your thoughts of the Childs Farm Hand and Body Lotion? Have you tried out any of the other Childs Farm products?